The protocol for treating malaria in pregnant women in the first trimester differs from the rest of the adult population. With this in mind, MCSP and the President’s Malaria Initiative developed a two-page job aid to assist service providers in assessing women for pregnancy as well as correctly diagnosing and, if needed, treating them for malaria. 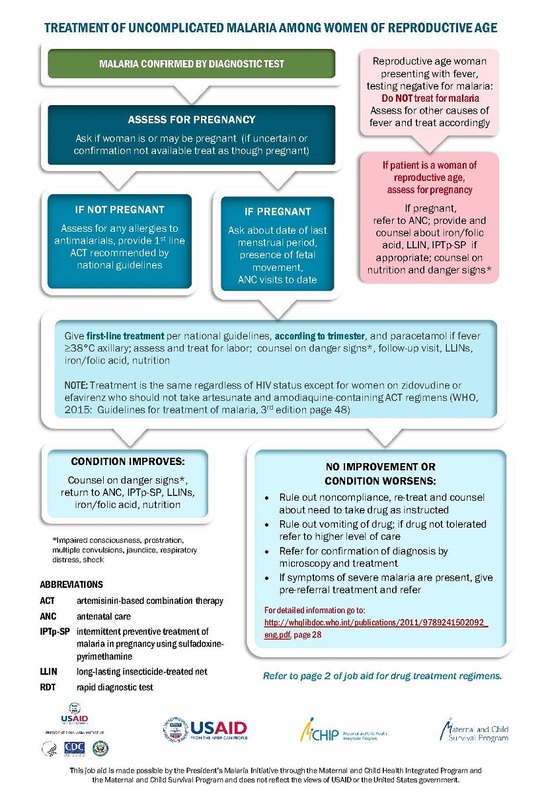 Based on WHO guidance, the aid includes a flow-chart on the steps for malaria diagnosis and treatment, as well as information on signs and symptoms of the disease. Medications— categorized by “uncomplicated” and “severe malaria”—are organized by trimester of pregnancy, and additional sources and references are listed.